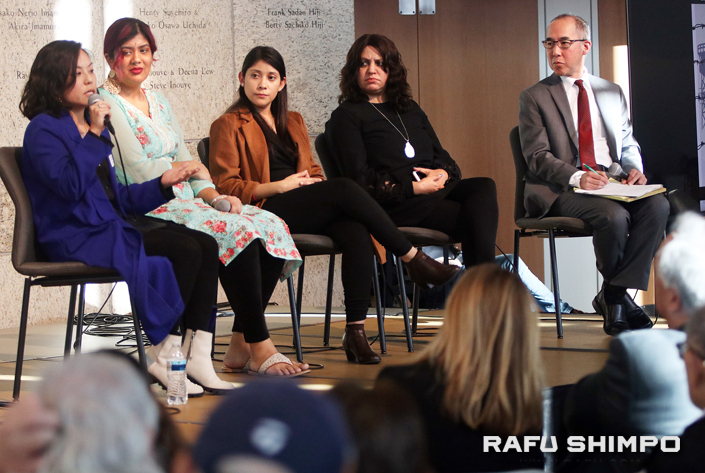 Immigrants share their stories at 2019 DOR. Following is Part 2 of a report on the 2019 Day of Remembrance program held at the Japanese American National Museum on Feb. 16. A panel discussion was led by Brian Niiya, content editor for Densho. “Before Japanese Americans were sent to concentration camps in 1942, they were immigrants who came to this country from Japan starting in the late 1800s,” he said. “We don’t necessarily talk about that a lot in our community, but a fair number came in contravention of immigration laws — some by literally jumping ship and swimming to shore, some crossing the border from Canada or Mexico, some using fairly elaborate fraudulent passport schemes to gain entry. “As a racially distinct population that spoke a different language. They were easy targets and scapegoats for nativist and opportunistic politicians that portrayed them as dangerous, nefarious, inscrutable, and laws were soon passed restricting their immigration, prohibiting them from buying land or from becoming naturalized citizens. These were the parents, grandparents, great-grandparents, maybe even great-great-grandparents of many of us in this room. Sigrid Toye, a psychologist studying the children of German American internees and a board member of the Tuna Canyon Detention Station Coalition, was unable to attend due to illness. In a statement read by Niiya, she said that her father was picked up by the FBI during WWII because he was a prominent businessman. “What followed was wrenching — the separation of our family, my mother’s lack of skills … Hiring Germans was not popular at the time, so things weren’t good at home. Spam in cans, Dinty Moore stew with white rice was the Sunday dinner. Apricots from the trees when there was little else. Leticia Bustamante, a DACA recipient who came to the U.S. at age 5 from Tijuana and a project coordinator at the UCLA Labor Center, recalled, “The reason that we decided to come to the United States was because my grandmother at the time had a very aggressive form of cancer and we could no longer afford chemotherapy. The money that my parents were making in Tijuana was not that much, so my dad came in U.S. to work … to make some money and go back to Mexico. Bustamante recently graduated from UCLA with a major in political science and a minor in labor and work studies. She started college at a time when the California Dream Act was available for undocumented students. Since her permit expires in Octobr 2020, Bustamante said, she too is living under a cloud of uncertainty as the future of DACA continues to be debated in Washington. “They separated the parents from the children. What happened then was the detention centers got flooded and all the immigration detention centers no longer could accept people. So what the federal government decided to do was to place approximately 1,000 people into the Victorville federal prison … without an access to an attorney, without access to an immigration proceeding, without access to interpreters, with terrible conditions. There were provided rotten food. They were not allowed to go outside. With migrant caravans coming through Mexico from Honduras and El Salvador, Okamoto and her staff have gone to Tijuana and Mexicali to do “know your rights” training for asylum seekers. “It was frustrating that … they were requiring all asylum seekers … to prove that they have a lawful entry into Mexico to ask for asylum to the U.S., which is impossible because the Mexican government did not provide any sort of legal entry to any of the caravan members.